Many people love an open, roaring fire. For those who don't it is probably because they are lazy to clean it out and it is less of a hassle to have something that you plug in at the wall. To many, this cannot really be classed as a proper fire. You have to admit, that smell you get of a real fire as you enter a home, can not simply be replaced by gas. This is just so inviting. There are, of course advantages and disadvantages to both methods, but you will have to weigh up your options and if you are really passionate about open fires then you will most likely go the way of the open, manual fire. The next thing to think of is firewood storage. This will normally come in the form of racks. There are other means that you can store your firewood in, but if you use a rack you will find that the wood will dry out in a much faster time frame. 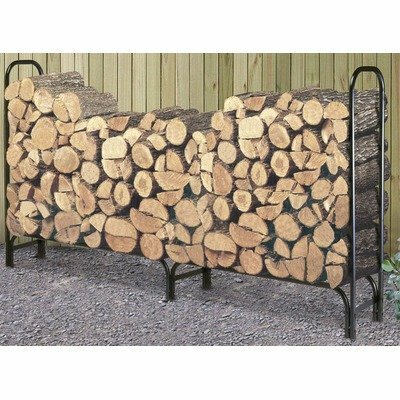 A steel firewood rack will make the perfect choice for indoors or outdoors. It is not very eye-catching, but does make a nice feature and you can buy one to suit your decor. They come in all shapes and sizes, so you will be able to find something to suit your needs. A small rack can be placed inside, and you would use a larger rack outdoors and then keep it on your patio or in the garage. They have a very good functional purpose as well. The advantage of the rack is that it keeps the wood off the floor and allows it to dry with a lot more speed because air will be able to circulate with greater ease. There is less mess and it looks a lot better by putting it in a rack. You are able to organize the wood better and make it look neat. If it is in the open you may want to find a cover and this will keep any moisture away. 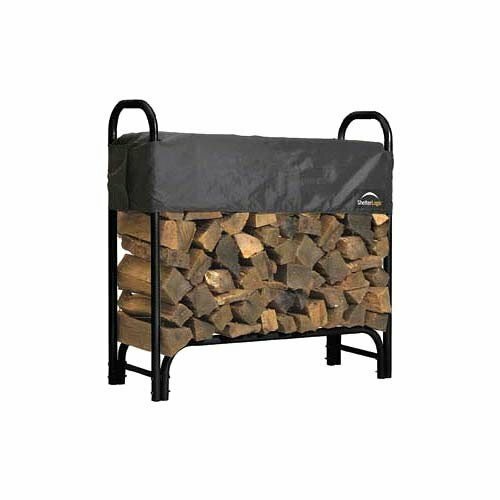 People who need to store a lot of logs outside will usually choose a firewood rack. This comes with a cover and is usually not as ornate as a log holder, which you may find in front of your fire place. The cover is to keep any moisture out. It helps to dry the wood out and also keeps it organized. Some people will like to keep one of these racks on their porch because it can make a nice feature and then they would choose one that is more decorative in design. However, you must also make sure that it is not going to rust. A log holder, is used inside and is smaller in size. Often it is used more as an attractive feature than for a functional purpose, but it will also keep the logs dry and organized. They will come in a variety of materials and you would choose one that would suit your decor. Something that complements the logs is also a good idea that one might opt for. 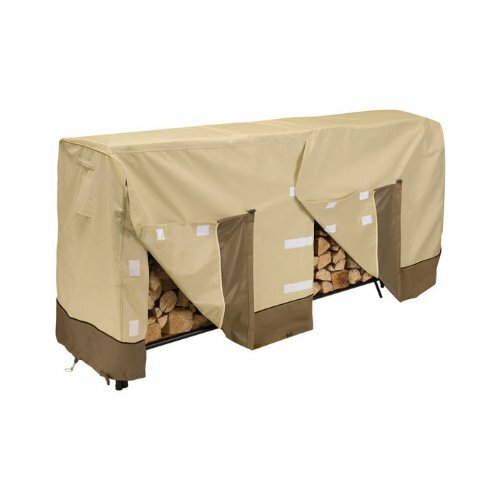 A firewood rack cover is more than necessary if you are thinking of buying a firewood rack and have a lot of wood to store. Even though you may not even be storing your wood outdoors, you have to realize that moisture can still seep inside the wood. Everyone knows that any drop of water is not going to help when you light your fire. The point of having a rack like this is so that your wood is kept dry. Your average garage or shed is very different from a solid built house, where the wood will be more protected. Of course, this is not the only reason why it is recommended that you get yourself a cover. There are also things like rodents and other insects that have a nasty habit of burying themselves inside the wood. Some of these little creatures love gnawing at the logs. In some areas, where it is perhaps more rural and there is more wildlife, there will be large animals around, and a cover will prevent them from disturbing your wood. When you are choosing the cover make sure it is water tight. It will normally come with the firewood rack, but it is also sold separately, in which case you must remember to take the measurements along so you can find something that will fit exactly. You know have to be organized in the winter months because you don’t want to be running back and forth, especially when it is cold. You want to know exactly where your logs are stored so access is easy. If you don’t plan for this, then it can really become chaotic. A firewood rack will make everything neat and tidy. To prevent any moisture entering inside, make sure you have a cover. This will also keep any wild animals away as well as any bugs. Once your wood gets wet, you are basically ruined, so you have to have some form of protection during the harsh winter period. If you do add a cover, you will add a many years onto the rack and you won’t have to replace it so soon, so it is definitely a good idea. There won’t be any groundwater you will have to step through either. Have a look at this article on Tuscan Decor to see what else you can do to change your house into more of a homely environment.